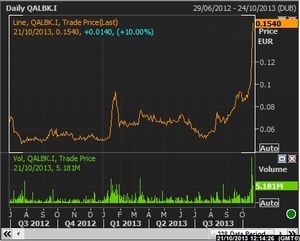 That’s Allied Irish Banks’ rocket-fuelled stock price. The bank is now capitalised at €78bn or $99bn. Ahead of the Irish 2014 budget (which is expected to include a fresh bank levy) along with the forthcoming stress tests, AIB is trading at an heroic 12 times NAV. The thing to bear in mind here is that AIB has a comically small free float — just over 1bn shares, against the 517bn or so in issue. Some 516bn of those are owned by Ireland’s National Pensions Reserve Fund Commission. AIB is 99.8 per cent state-owned. So why is the price so inflated? Investors are aware there’s an overhang, right? There’s no sane explanation. Best guess is that with shares in bigger rival Bank of Ireland (market cap €8bn) rising from 21 cents to circa 25 cents this month, AIB, currently at 15 cents, has been tracking it higher. But there’s also another factor that may be at play here: when, on December 30, 2011, the Central Bank of Ireland announced an end to the ban on shorting financial stocks, which had been in place since September 2008, it didn’t include AIB. So AIB can’t be shorted! Financial Times: It’s All To Play For Have You Seen Our ‘Soggy Patch’? Anything Good Behind The FT Paywall? Posted in Misc and tagged Eejits, FT at 3:04 pm on October 21, 2013 by Broadsheet.